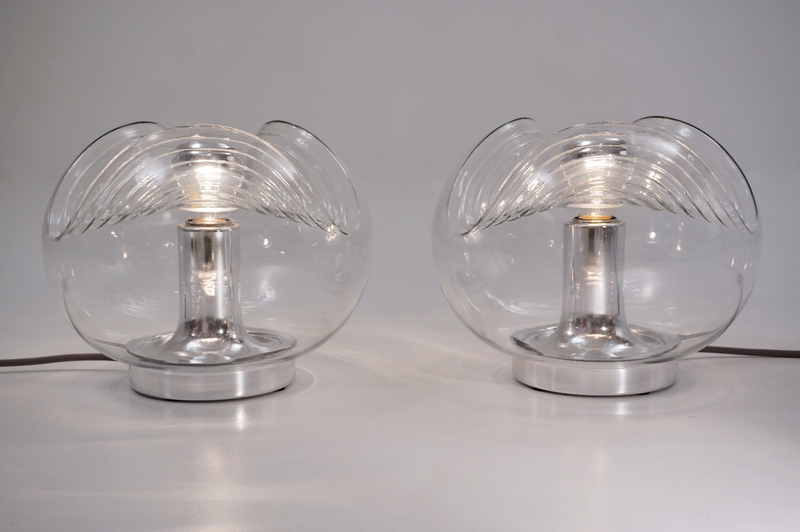 Peill & Putzler pair table lamps, glass & chrome, 1970`s ca, German. Both lights have been thoroughly cleaned respecting the vintage patina. Newly rewired & earthed with grey silk cable, new E 27 silver metal lamp holders, black cord switch & black plug, in full working order & ready to install. 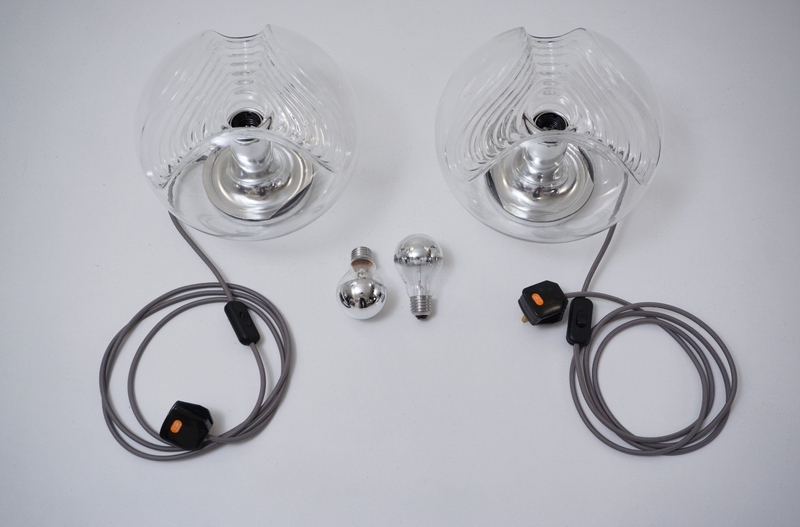 Two Silver Crown Light bulbs are included in the price. It is possible to use these lights in other countries although it may be necessary to purchase different light bulbs suitable to local electricity. They can be used with a dimmer. 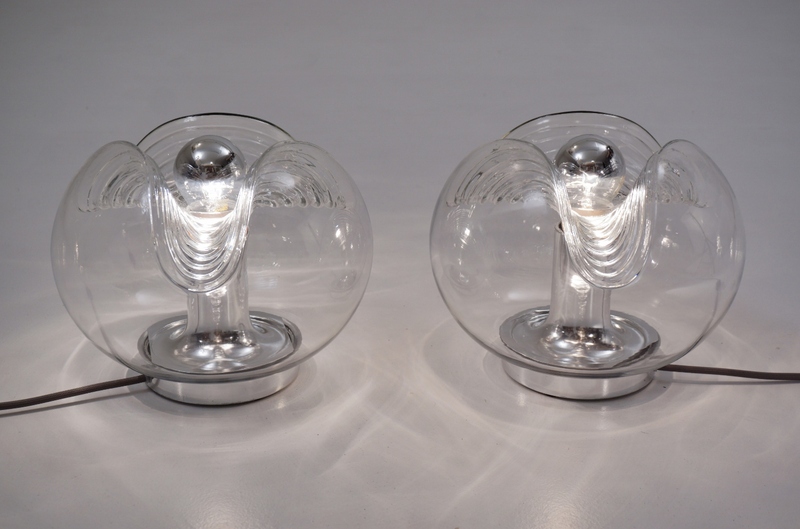 This pair of vintage lights, by quality German manufacturer Peill & Putzler, were designed to work as table lamps and are quite rare to find in comparison with the Putzler flush light of same design. Putzler`s Modernist sculptural design in these vintage lights is quickly becoming a design classic and iconic of the early 1970`s. 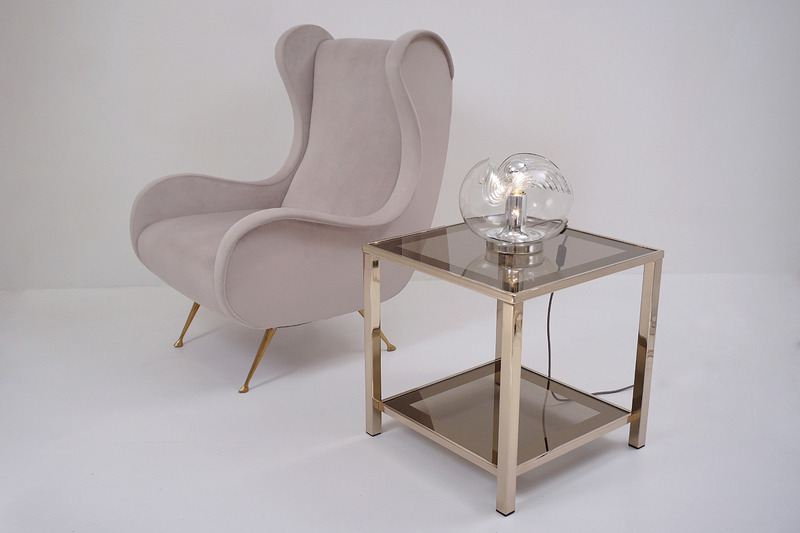 These vintage table lamps have a Futuristic presence. The design is curious, modern, & very sculptural. 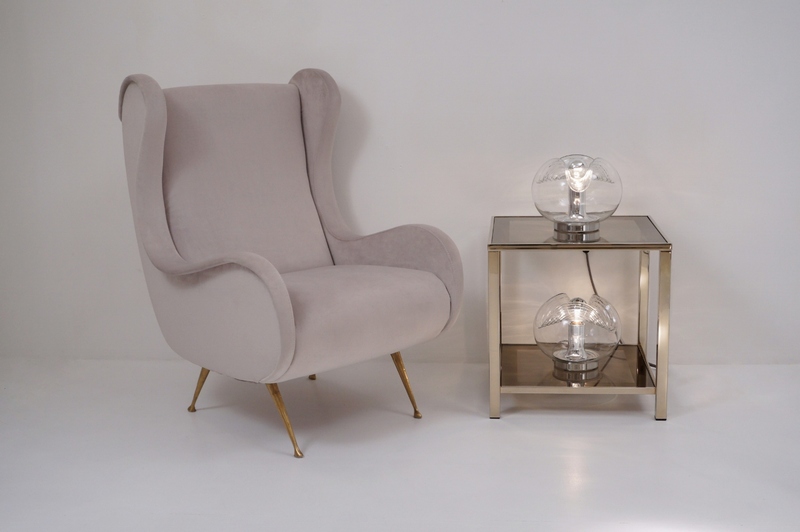 They would give a great decorative effect to a range of interior schemes such as Art Deco, Modernist, Minimalist, Hollywood Regency, 70`s Glamour, Postmodern, Industrial or Contemporary. 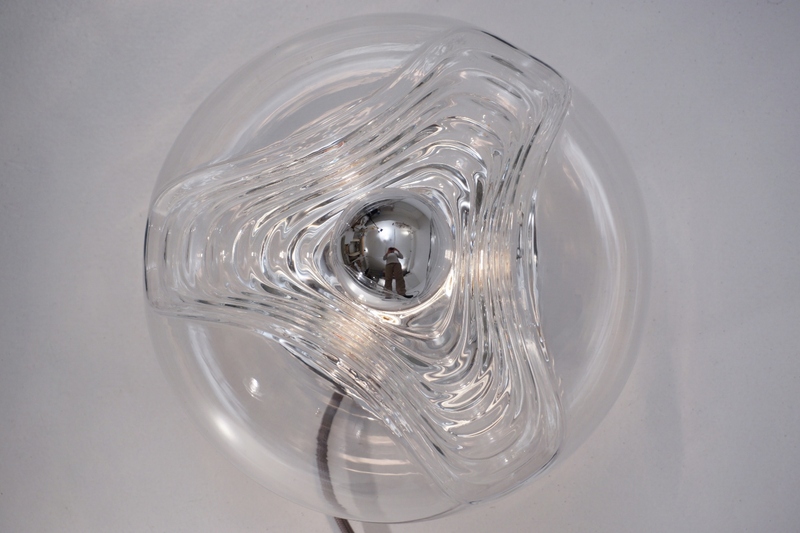 A sculptural textured circular clear glass shade is fitted to a metal lamp holder in the centre, by a reflective silver metal elongated piece in the shape of a curved column, and then after to a round silver metal base at the bottom. 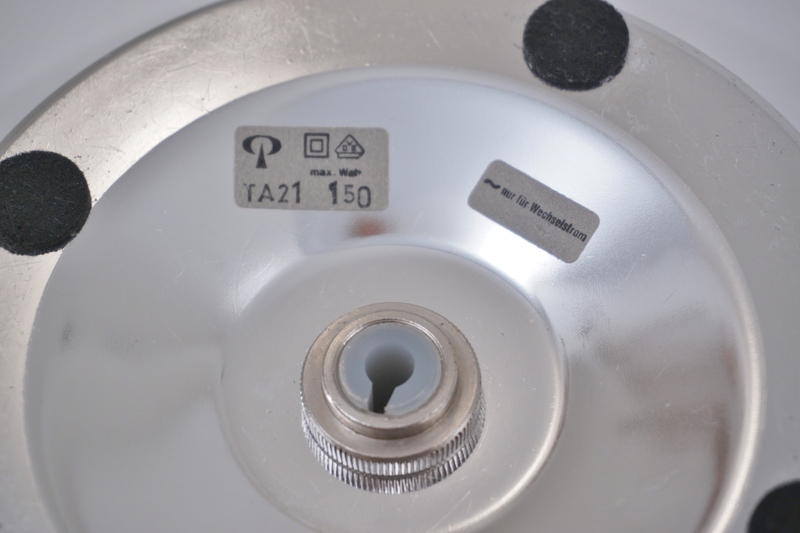 The back side of the round metal base is in silver finish and has a ring at the centre that screws all the components of the light together. There are also 4 black felt stoppers to protect the furniture. The maker`s original label is present on the back of the base. 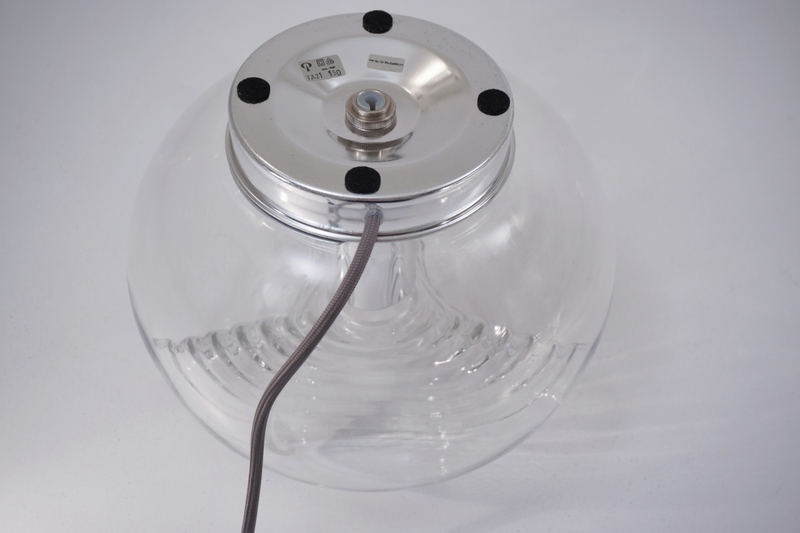 Each light carries one standard big screw E 27 light bulb up to 150 Watts. 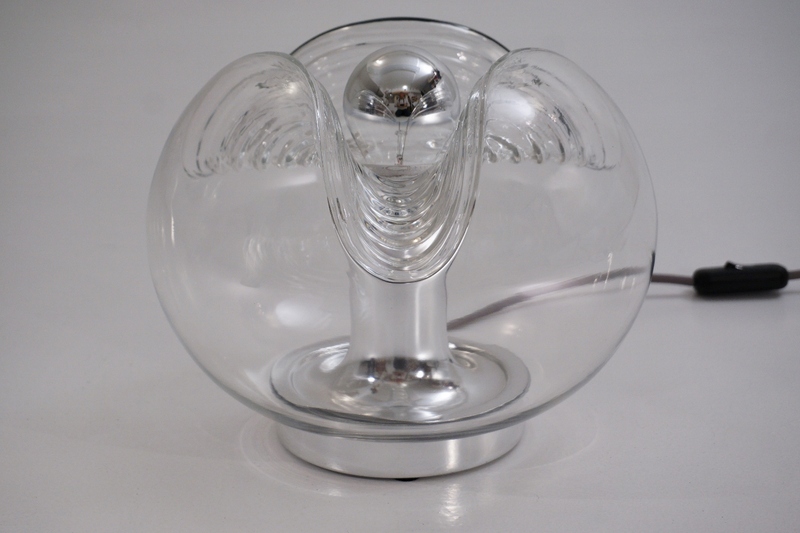 At present fitted with Crown Silver light bulbs of 60 Watts, which are included in the price. These light bulbs are easily available in most lighting shops or over the internet. These lights though could take any other E 27 light bulb for a different look. 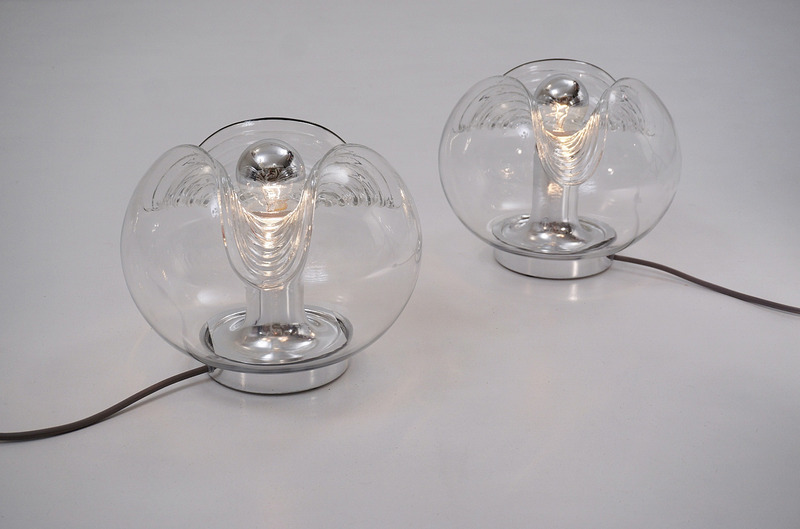 This pair of vintage lights are in very good condition. The 2 glass shades are in very good condition with no chips or cracks. The metal frames are in very good condition and sound. There is minor patina as tiny marks on glass and metal in line with age & wear. These lights sell together and the price featured is for the pair. Packing is offered free of charge. We take special professional care while packing. For safe transport, the lights would be individually wrapped in a layer of bubble wrap and soft cardboard. Together they would easily fit into a box with loose fill packing peanuts ideal for posting and shipping. The diameter of the metal base only is 13.5 cm. 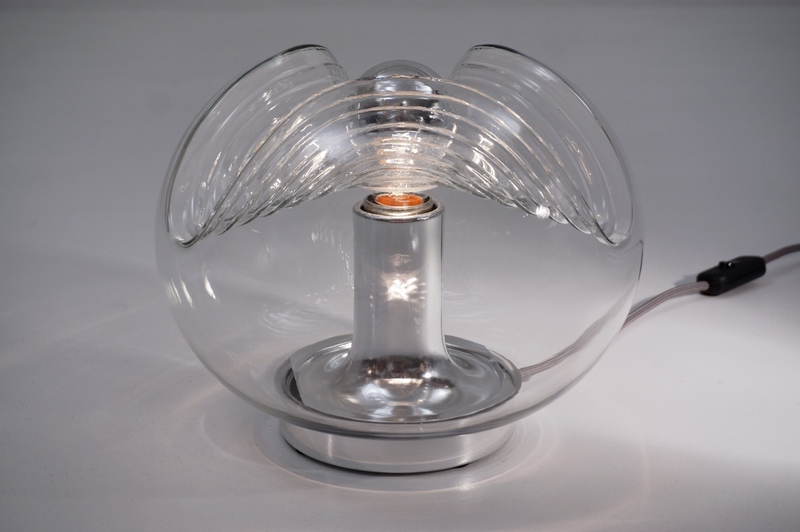 German manufacturers Peill & Putzler merged together as a glassware & lighting company in 1947. Read the rest of the company`s history on our Roomscape blog about Putzler Lighting.